Just before 7:00 am this morning, I’ve always been an early riser, more Blue Jays than I had ever seen before swooped down in the drive to begin eating and drinking. It was sprinkling and still very dark but I was able to make all of them out. Knew that it would make an awesome picture with well over 10 Blue Jays only in this tight group. Of course when I came back to that window after fetching my camera, at least half of them had flown away. I quickly set the ISO to 800 but realized it was not working after the first two shots. Not much better at 1600 ISO. Hand held, dark and rainy. I have been ill for over a week now with some kind of viral sore throat, bronchitis deal. I do get allergies around this time and I came down with it after running errands a couple of days in a row in thick fog. Even when I try to breathe through a scarf, it can still effect me adversely. My apartment backs up to woods with all kinds of wildlife out here. Before I became ill I took pictures of some deer grazing right outside my window. I apologize for the poor quality of shooting through my screen. The windows have a special immovable screening that covers the entire window for safety and security or they are just cheap. These are some shots I got a month or two before when I was outside, which are a little clearer. I try not to get to close and spook them as I did this fawn. His brother could care less I was there, he was hungry! These are even earlier still. My next post I will be sharing my Cheesecake recipe with you all! First Cheesecake in a very long time and sadly it will not be my last! Next one will be Pumpkin Cheesecake. Forgot to take a picture of a mock pumpkin mug cake that I nuked in 90 seconds. Came out perfect. Just a plain cake replaced liquid with Coffee-mate Pumpkin Spice. I will include this recipe when I complete the Pumpkin one within the next couple weeks only adding some actual pumpkin pulp next time. I just purchased the sugar pumpkin to pressure cook in my Instant Pot. I prefer fresh pumpkin to the canned any day. I have been obsessively starting my days for the last few years with coffee. I had quit all caffeine except that which was found in chocolate for many years because I didn’t need it. I had always loved a good cup of coffee and when my son moved back home for a short time, he got me drinking it again. 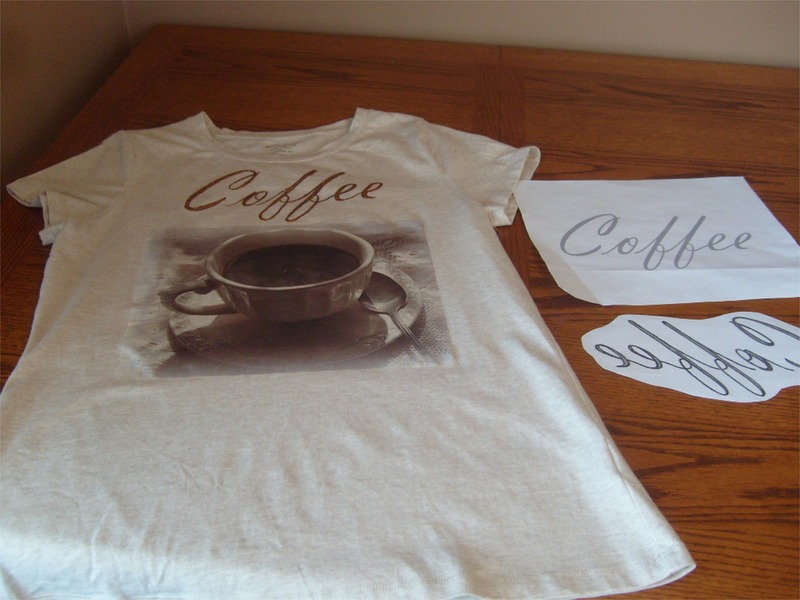 Created my own coffee T-shirt a few months ago by transferring one of my coffee photos with the simple message “Coffee.” I printed the word coffee in Vladimir script in reverse so I could go over it with a transfer pen and iron on. I then went over the lettering with fabric markers.